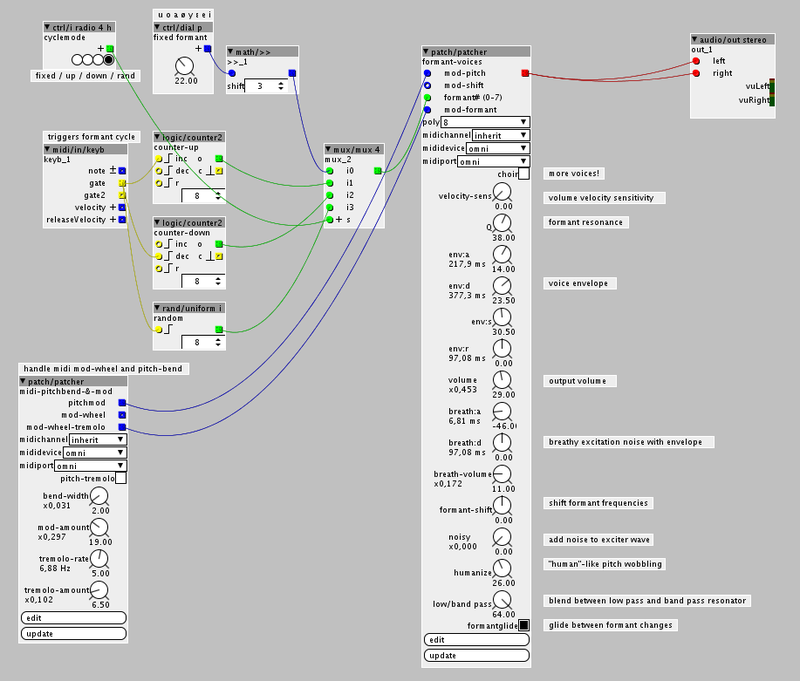 A vowel-singing formant synthesizer. I took the average formant frequencies from Wikipedia and built a lowpass/bandpass resonator pair around them to form formants on a simple saw wave. Play the synth via MIDI. 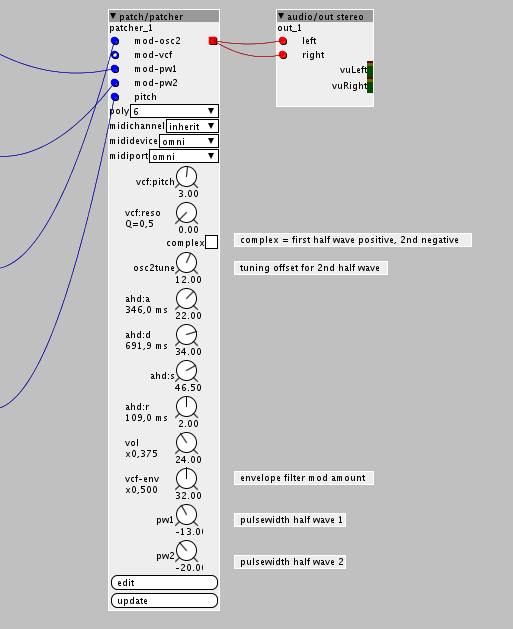 The 8 voice polyphony drives Axoloti to the edge, but it's working. Select one out of 8 formants (vowels) or cycle up/down/randomly with each pressed key through them. Add noise to the straight saw wave to give the sound more grittiness. Additional breath-like noise exciter with ad-envelope to spice up the beginning of each note. Blend between lowpass and bandpass resonators to select more boom or grit. "Humanizer" to add pitch wobbling like I would be singing. Glide option to smoothly glide between changing formant setings. Tell me, what you think about it! I'm preparing to add a subpatch to the contrib-library, which allows to formant filter everthing you put into it. Whauu!! great patch!! similar to a preset in the Continuum ! up to 7 voices and all goes "phonetically" Awesome!! I wonder why my axo setup can handle 8 voices polyphony and yours doesn't? Could it somehow be related to the usb-attached computer? Mine is a 3 years old mac mini and axo is attached via the monitor's usb-hub, but midi is coming from the din port via an external midi hub and not through the axo usb connection. yep could just be... 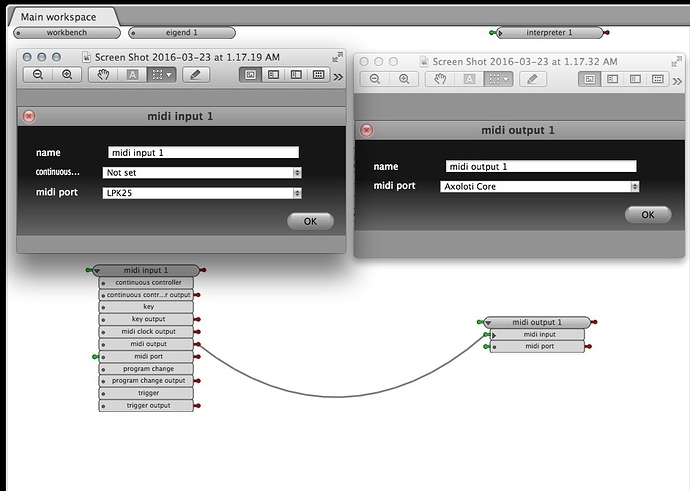 I can test only going thru DIN MIDI; in a couple of minutes. wierd? is it all pact/patchers are in midi device omni? Some light why this happens? Cannot have 8 voices - Axo and LPK on same (reliable) USB HUB. @thetechnobearSome light why this happens? so you are saying you get 8 voices when connect via device port (e.g. usb keyboard) but not when its connect via the host port? and does the patch stop playing, or your disconnect the UI? midi din vs midi device vs midi host are all slightly different code lines, or perhaps your LPK25 is sending a few more messages, at a higher rate? if the UI is just disconnected, sometimes this can happen due to a little extra load when the patch starts, which means the UI times outs, but the axoloti patch itself is running fine. all that said, Ive not had a chance to play with this yet, so the above are just ideas. generally, Id say, always leave a little headroom on patches... as even if they work today, there is a possibility a firmware upgrade in the future might 'tip the balance'. of course the opposite is possible that future versions are more efficient, so you will gain some headroom, to play with later, and that point you can add more voices. 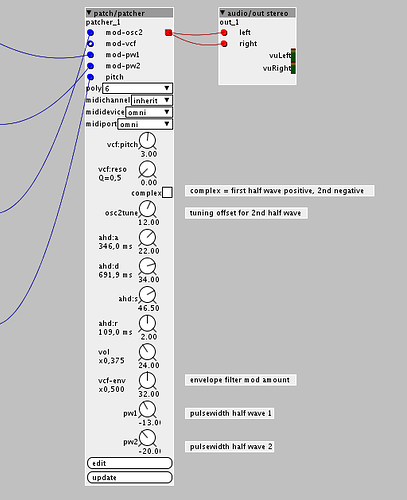 A little synth experiment inspired by Ploytec's little πλ² (or PL2) box. It produces mostly "squary", chiptunesque sounds but also fat and bassy brassy square pads. A single wavecycle consists of two pulse half-waves. The pulse width of each half-wave can be modulated independently. The pitch of the second half-wave can be adjusted relative to the played pitch (fifths and octaves work well). The "complex" mode lets the first half-wave produce amplitudes above zero in the positive range and the second goes below zero into the negative range. The priciple can be observed on an oscilloscope (and sometimes the waves look nicer than they actually sound ). The patch has a lowpass filter which can be envelope modulated. And, as before, when the patch refuses to play, lower the polyphony (currently it's 6 voices). A granular sounding long-tail reverb tank. It's "fake", because it doesn't use any granular techniques. The incoming audio is randomly sliced into little chunks and fed into the left and right channel of the reverb tank. And furthermore the reverb's feedback loop can also be sliced into chunks or chunked into slices, if you like. You can adjust the slicing frequency, probability and the shape of slices (a simple attack/decay envelope). The reverb tank has two delay lines with two taps each. You can set the amount of short and long delays. And of course feedback... lots of feedback. Since it's easy to overdrive the delays with too much feedback or sustain, there's a compressor/limiter in the output chain to protect whoever is listening (and to keep the ringing tail sustained). There's a "stereo-width" dial before the output to spread the delay lines between the stereo channels including a simple "haas" delay widening effect. The patch uses about 30% CPU and operates on "audio in left". I don't have the guts to put this patch into this month's Effects Challenge, because it has far to many parameters and I couldn't decide which of them are the five most crucial to have fun with. Aaah, presets: I still can't get my head around axo's preset system, but I tried to give the patch two presets. Preset 1 is a long lasting grainy reverb and Preset 2 is more sliced and chunked (but also likely to explode). I just sync'd my library and found it first time. Ah ok it's there actually. But why are the other contribs available via the patch browser and this one not? The fake granular verb sounds cool but the first delay taps are really audible which makes it feel more like a delay that diffuses into a reverb. Still great though! The other patches in the contribution library are saved as subpatches and can therefor be looked up via the browser. Regular patches has to be accesed through a reugalr browser. Ah that makes sense, thanks! Easy organs! Made an object of things I wire and then copy&paste a lot. Sine wave oscillator with 7 additional harmonics: sub octave, 2nd, 3rd, 4th, 5th, 6th and major 7th (2 octaves up). The intervals are pure intervals and not equally tempered. The levels of each harmonic can be modulated separately. One instance uses about 8% CPU. Best approach for additive 'organ' patch? Smoothing 8 out demultiplexer (k-rate fractionals). 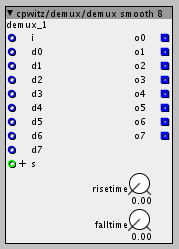 Same as the factory "demux 8" but the output values can be smoothed exponentially with adjustable rise and fall time.